It was a little past 12 in the afternoon on 24th March 1987, when the country was about to witness ISRO’s first ASLV launch from the SLV launch pad at the Satish Dhawan Space Center in Sriharikota. The occasion had gained extra significance, since the then PM Rajiv Gandhi had been invited at the mission control center to grace this much-awaited occasion for the country’s space program. Work on the ASLV had commenced in the early-80s to develop the technologies needed for placing payloads into the geosynchronous orbits, and were expected to be used in the GSLV later. However, this euphoria soon dissipated that afternoon after the ASLV-1’s first stage failed to ignite after the strap-on burnout and the rocket plunged into the Bay of Bengal a little while later. Rajiv Gandhi had to console the ISRO scientists and the nation in general live on DD, as he wished them success in future. Unfortunately though, ISRO could not carry out its first successful ASLV launch until after Rajiv Gandhi’s death in 1991. The journey thereafter has been more eventful for the ISRO scientists, as the next generation launcher PSLV has proved out to be an amazing success. Only one partial and two complete failures have taken place since the PSLV’s first developmental flight in 1993, among those being its 41st launch on 31st August, 2017. With an almost 93% success rate (check out the table below), and a long list of its foreign customers, the PSLV continues to be the ISRO’s workhorse despite its unexpected last hiccup. This was recently emphasized by the Antrix CMD Rakesh Sashibhushan as well in a program to mark the company’s 25th anniversary in Bangaluru. He described the PSLV-C39’s last setback as a part and parcel of the space business. A summary glance on the biggest space launchers would also endorse this particular view of him. The below given data shows how the PSLV’s overall success-failure ratio stands at par with some other most successful and credible space launchers from around the world. Which in turn brings out the PSLV’s significance in the space launch arena. I’ve not included the data of Soyuz, Soyuz-U, Soyuz-U2 and Soyuz-FG from Russia, Long March 2F from China and Saturn-1, Saturn-1B and Saturn-5 from the US into this list. Some of their online compilations are quite extensive and difficult to summarise. 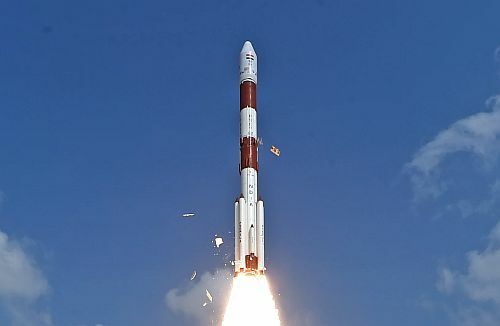 PSLV does not stand in the same league, anyway, as most of these launchers were meant for either carrying out manned space missions or for placing satellites into the geosynchronous orbits with far more payload capacities (in fact, Saturn-5 would seem like a monster when you compared it with the PSLV). However, I’ve included Ariane 4, Ariane 5 and Delta 4 with far more payload capacities as compared to the PSLV to give an idea about how the latter fares amongst the most successful space launch vehicles to this day. GSLV-Mark3 is expected to enter the big league of launchers in future, though, if it continues to successfully launch the 8000 KG payloads to LEO, that it can now. To summarize this, there is a well-coveted place set aside for the PSLV among the most successful launchers from across the globe; both, in terms of their payload capacities and their rate of launch successes over a substantially long period of time. And there is no reason why it won’t continue to remain there despite the recent failure it had to go through while placing the IRNSS-1H into its intended orbit.